With the other day being the first day of spring for me I like to start giving our home a good spring clean. I wanted to share with you today my cleaning kit of the cleaning products and tools I like to use around the home. Now you may not want/need all of the items I use. You may want to or you may want to use some of them or different products altogether its really up to you. When it comes to cleaning products I am not brand loyal and tend to use whatever is on offer. I've even started to like the idea of making my own to save us even more money but I think that calls for a separate post. 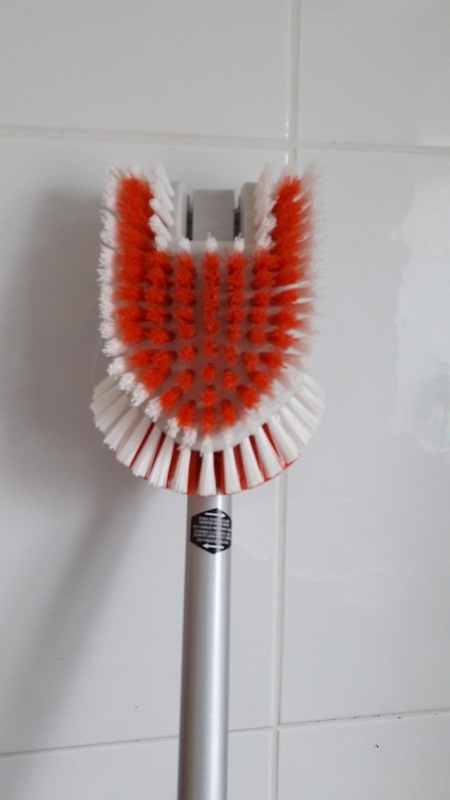 This is a must in my cleaning kit as you can use it on a wide range of different surfaces and doesn't have to be used in one set room like some products are. The current two I am currently using are Amway multipurpose cleaner and the Method multipurpose surface cleaner. Cleaning the oven is one of the jobs I hate the most. So having a good cleaner to help me out is a must. Again the Amway one is the one I'm currently using but I have used various other brands too. Cleaning wipes are so handy to have around the home but also for when you are going away they are great for packing away in your bag. Amway do a handy box of x4 packs of 24 wipes. I also like the ones from Aldi which you can get in lemon and apple scents. I use the ones from Method at current. I'm really loving the brand and the fact that they have no chemical nasties and they don't test on animals. Currently they are collaborating with ink evangelist, Johanna Basford on a beautiful new limited-edition range. Designed to bring colour to your home and a smile to your nose, the new Hummingbird Garden collection is perfect. The main brands I use a Harpic and most recently ACE who now do toilet cleaning gels as well as their stain removers for keeping your clothes clean and stain free. These are so handy to have in my cleaning kit as its great at cleaning walls especially if you have a toddler who gets crayon happy around the home. I just picked up a pack from my local Poundland however I am sure most places sell them. I use to store all my cleaning products randomly under the sink. However in my attempt to be more organised I picked up this cleaning caddy in Aldi for £3.99 which is what I store the majority of my cleaning products and a few tools in. This means that I have everything I need and all I have to do is grab and go. Having a good selection of cleaning tools is a must and I have a wide varity that I like to use. Some may not been essential as you may just need a bit elbow grease however I think they are all amazing products which I fully recommend. I like to have a good selection of cloths to hand. I always have a selection of Microfiber ones which I picked up from Poundland and are in lovely bright colors. I also have a selection of multipurpose cloths from both Poundland and Bizzy bee. When I am done using cloths all i have to do is throw them into the washing machine. 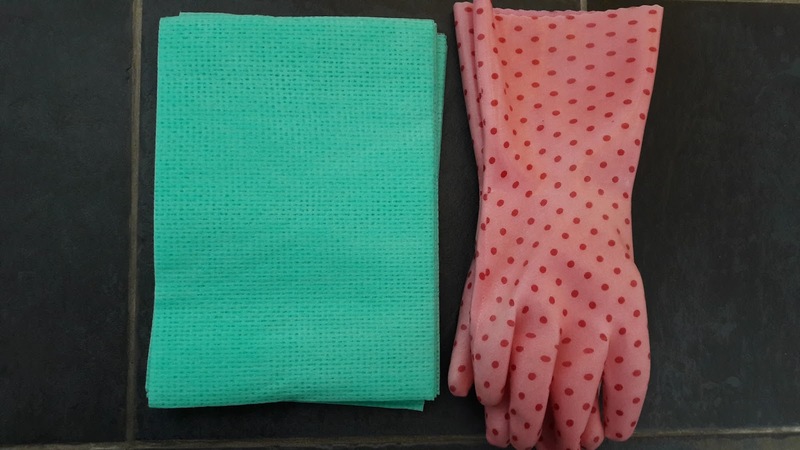 Gloves when cleaning are ideal for protecting your hands and Bizzy Bee have a whole range of different ones. Bit of a random one but I like to use an old toothbrush in my kit so that I can get into the smaller areas that are in need of a good scrub. 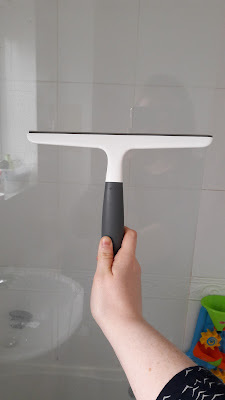 I've recently started using a squeegee and use this one from OXO. It's now an essential tool for cleaning the glass door of our shower. It's great at removing excess water to prevent mold and water marks. 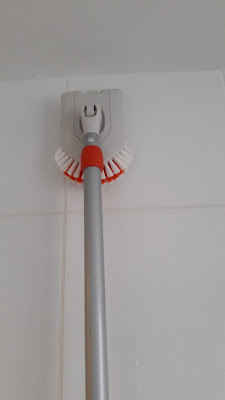 Again from OXO this extendable tub and tile scrubber is ideal for getting into corners as well as around the toilet and areas that I find hard to reach, It extends from 66cm to 106cm meaning if I need to reach the ceiling I can do very simply. 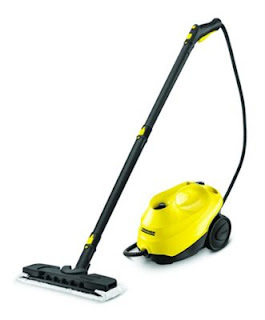 A good hoover is a must and we have the Dyson DC40 which we purchased just over a year ago now. We have used other brands and have found them to not last long and are nowhere near as good. It's the same one Appliance Hunter talk about in his guide to upright vacuums. A good hoover is a must and we have the Dyson DC40 which we purchased just over a year ago now. 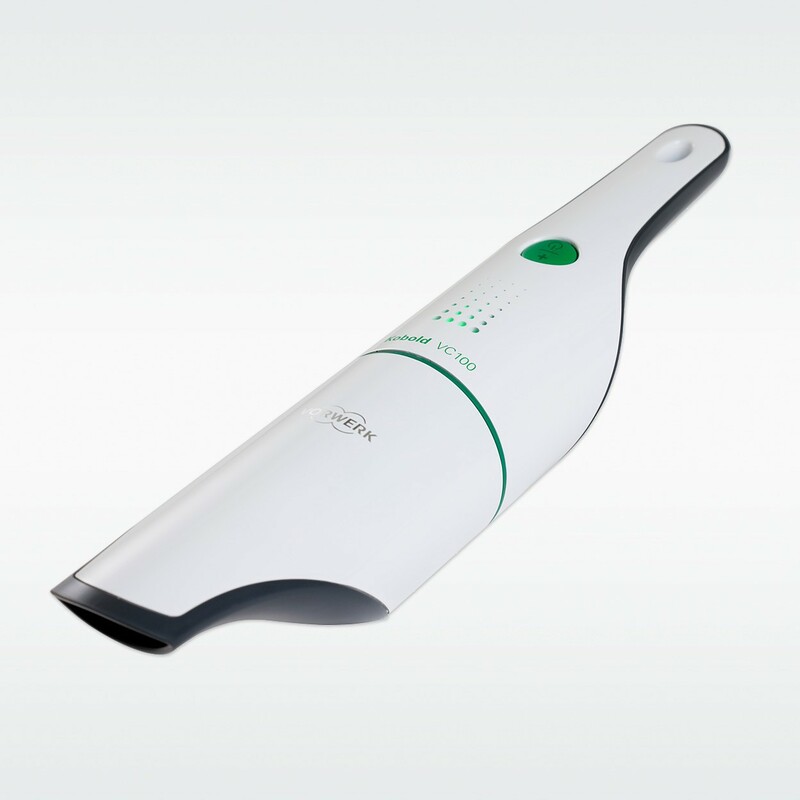 The Kobold VC100 is a handheld vacuum cleaner that weighs the same as two cans of Coke. It's easy to handle and recharge, it's also compact too so you don't have to be worried about space. This vacuum has been a god send for us for cleaning up after Blake has eaten or when we just need to hoover a small area. I never thought I'd need a mini vac before but for me it really is worthwhile having. The Karcher SC3 Is a steamer with a refillable water tank that provides the option for non-stop steam to give you a continuous deep clean. This model also features an innovative flow heater system, meaning steam can be generated in just 30 seconds. The SC3 also features accessories such as the ergonomically designed floor nozzle and the “round brush” attachment, capable of cleaning intricate areas and perfect for the kitchen or bathroom. I am in love with this steamer although we had it very briefly it works so much better than our previous steamer as well as being easy to use. So there you have it my cleaning kit which features the cleaning products and tools I like to use. Whats in your cleaning kit? Will you be doing a deep spring clean soon? I love using cleaning wipes - makes everything so handy. Need to get myself an organiser like yours to carry round the house! My house could do with a really good make over and clean. Feeling tired from winter, just like me. I'm liking the extendable brush, may have to look for one. I hate balancing on step ladders while I do the bathroom. I have a whole mixture of cleaning products too, don't stick to one brand. But I'm afraid I use a lot of bleach cleaner, because I have a 5 year old, cats and teens! How super organised are you! Put me to shame. I do love a bit of organisation though - brilliant! I hate cleaning the oven!! So anything that helps lighten that job is great!! I swear by those magic sponge erasers on my ceramic hob! And I know it's not very environmentally friendly, but I love bleach in the bathroom! My wife is a complete germaphobe, so I'm gonna have to show her this and see if she thinks we should the stuff a go! THIS IS GREAT! I'm trying to motivate myself to be cleaner and tidier so I've been weirdly watching lots of YouTube videos of Mum's cleaning routines and this is also great motivation. I need to get me one of those caddies so I can cart my cleaning products round the house with ease. Thanks for the motivation! It seems like you have a great cleaning kit. I agree that a toothbrush is great for reaching small areas. Wow such a great list, perfect for a non-cleaner like me. I don't have to worry about this stuff anymore because we got a cleaner a few weeks ago that comes every week now. It's such a relief because I don't want to be spending my weekend cleaning when it's the only time I get to spend with my kids. Cleaning tools for me is as good as make-up kits. The way we dress up and clean our house is the same way. Glad you had an awesome list of cleaning items. I also have most of it. Cheers to our cleaner bestfriends. Oh wow, I really need that cleaning caddy. MY bottles and things are shoved under the sink and it's just so messy. We have the mini vac you have too and love it. So useful! Honestly? 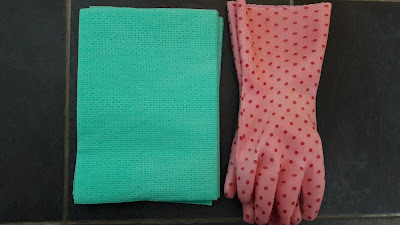 Some cleaning reusable cloth sponges and a spray made with vinegar and water. Cleans brilliantly. You have a great cleaning kit. I'd love a mini vac for cleaning up after the kids - especially in the car. Oh wow! 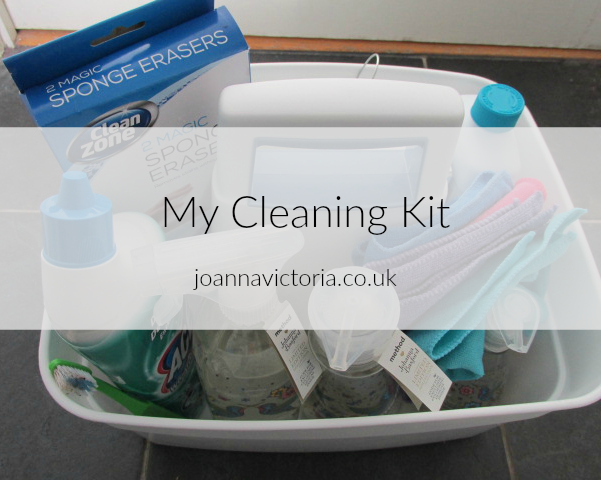 I am an absolute cleaning freak and love your cleaning kit! I need to buy that caddy though and the tile scrubber! Having new cleaning products makes me WANT to clean the house! I love sponges too. I haven't been living in my flat for long so my spring clean is going to be easy! Thank you for sharing about the OXO tile scrubber! I was only thinking yesterday about buying something like that. It must be destiny! Having the right kit definitely makes cleaning less of a chore - the magic erasers sound brilliant for busy family homes. The caddy is a great idea too, it would make my under-sink cupboard much easier to deal with! After reading your post I have realised that my cleaning kit is missing a magic eraser! They sound fab! I really need to give my house a spring clean, it really needs it! I love the little cleaning caddy you have to carry the bits around. I like antibacterial wipes so quick and easy to wipe down the toilet or a worktop.